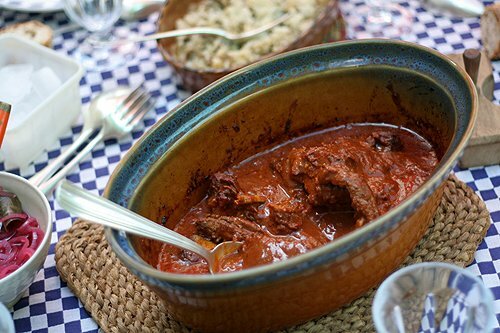 I recently made a fantastic red chile-cooked pork shoulder, similar to red chile braised beef and served these onions alongside, with some tortillas. 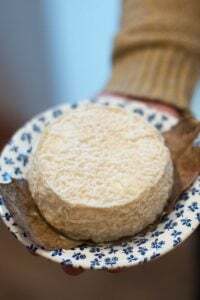 They have a stunning red color, which always surprises French guests. Red onions are considered sort of a specialty in France and are four times the price of regular onions, so they’re not used quite so often. But if you live somewhere where onions prices are equivalent, revel in as many red onions as you can, and feel free to double or triple this recipe. As Joni Mitchell sang, you don’t know what you’ve got ’til it’s gone. I don’t think she was singing about onions, although these pickled ones are certainly something to sing about. 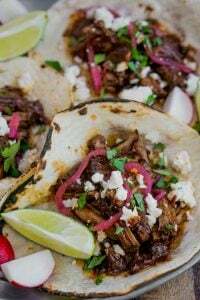 Inspired by recipes at Ms. Glaze and Simply Recipes.These onions make a over-the-top side dish and I serve them not just with Mexican food, but with barbequed meats and even chopped in potato salad. 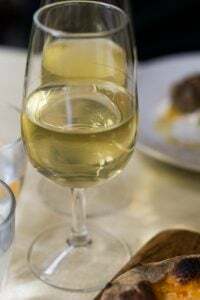 Reserve any liquid and use it to add tang to cole slaw or chopped vegetable salad.You can vary the seasonings. I used allspice and bay leaves, and sometimes I add a few kernels of black pepper and cloves. But cinnamon sticks and star anise would work, and I’m thinking of experimenting with very thinly sliced cloves of garlic or carrots, for contrast. My husband makes very good skillet cooked sweet and sour red onions. They take about 10 minutes to make and really perk up salads, quesadillas and other stuff that can take a hit of high impact flavour. I love pickled onions! One of the byproducts of having a Persian husband David is that Persians are very much into pickling and I’ve learned a little bit of it via Masoud. Pickled Tomatoes, pickled onions, pickled garlic just to name a few, are absolutely delicious complements to many meals and you often find them on a Persian table next to the yogurt and some rice dish or other. They call them Torshis in Iran. Your own onions look delicious and I bet that as a side dish to that pork it was superb. Lovely photos. They made my mouth water. I love this recipe; it’s very similar to one I make as part of a beet salad. 86 the cloves, add some toasted cumin seed and mustard seed about 1 tsp or two. Remove the allspice berries before serving. Roast three or four beets, peel and cut into 1/2 inch pieces. Mix with cherry tomatoes, halved. Add the pickled onions with the spices (except allspice berries) and enough pickling liquid to moisten, but you don’t want pools of it at the bottom of the bowl. If you let it sit 24 hours. it’s even better. The beets dye everything a jewel like red. Sometimes I throw in some chevre and toasted or candied nuts before serving. This sounds really good. I grew up eating pickled ham that I just loved and haven’t had in ages. The color of those pickled onions alone is worth the making of this recipe. I can only imagine what they taste like. Beautiful! Your pickled onions remind me of something similar my mother used to make. So delicious. 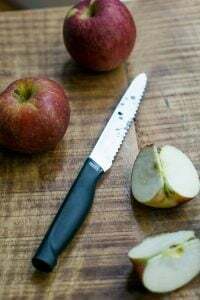 When we have so many wonderful vegetables and fruits to work with this time of year the most simple preparation is often the best. 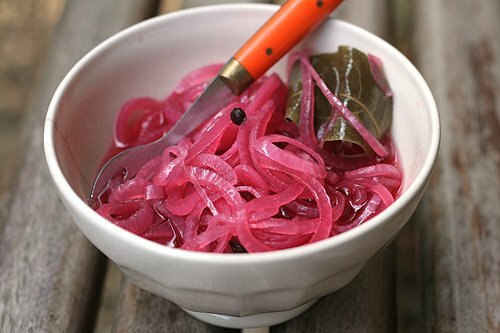 Love pickled red onions and love Zuni’s recipe, but like you, I find it too time consuming. Thanks for this quickie version! Just think: Your pickled onions baked atop Mark Bittman’s bread. Kind of like a “Ha! My onions beat your bread!” Or something to that effect. Pickled red onions! Yum. Next time you’re in Los Angeles, make a point to visit Loteria Grill – the original stall in the old Farmers Market and now also in much larger, slicker surroundings on Hollywood Blvd – for their Cochinita Pibil. Stringy pork slow braised in some sort of citrus juice. It’s rich but also very bright. Oh, it’s so damn good. They serve it with a garnish of thinly sliced pickled red onions and the combination is — well how do you say “dynamite” in Spanish? OK, it’s only 8:30am and I’m starving. Oh, and that orange fork in your photo? I might just have to come to Paris, hunt you down and steal it. I’ve been meaning to try this with some red onions that I have laying around my kitchen. There’s a similar recipe in Deborah Madison’s Vegetarian Cooking for Everyone. Jay: I bought some maple vinegar when I was in Canada years ago and use that on beets a lot. 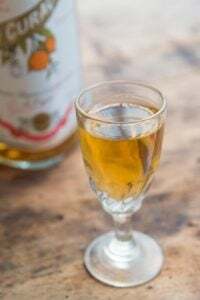 If you even come across maple vinegar, give that a try! Dave: I’ve been there many times, and that’s a pretty good place. Next week in San Francisco, I get to hit up my faves there. yay! hunh, remarkably similar to the recipe i’ve been making for years, except i swap out the chile for fresh horseradish. yours would be great for a pork dish like the one you have – mine is fantastic on a roast beef sandwich. mmmmmm. 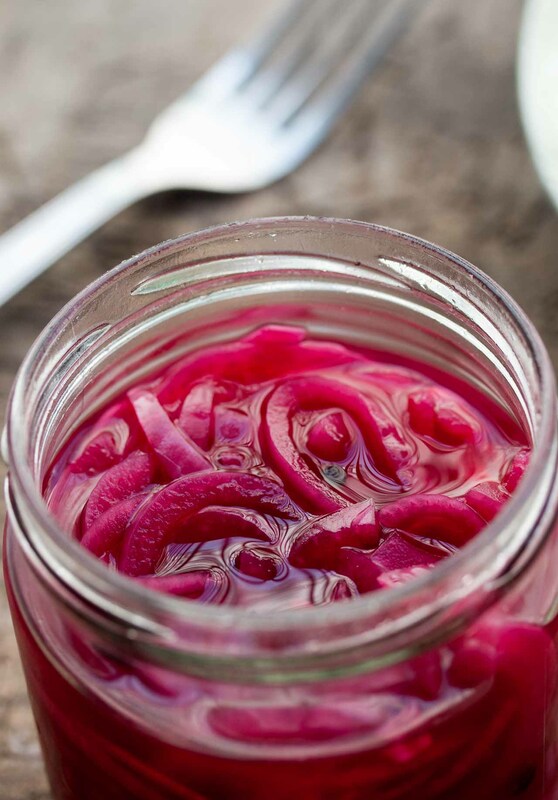 Mmm…Love red onions period– and yes, so easy to pickle. 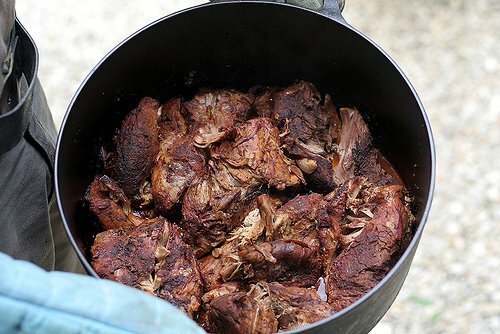 Made some a couple of months ago with pibil-style pork we roasted on the barby which was delicious. I don’t know about the cumin spiked chocolate balls, tho. Have you tried Chuao’s spicy Mayan chocolate? This brings back memories of my childhood in Penang… the man who sold fried curry puffs at the stadium would add some sliced pickled onions with them. So good. BTW, does anyone have a simple pickled cabbage recipe? One always seem to have to buy more cabbage than one wants, hence the dilemma of having too much. You completely read my mind – I had some incredible pickled onions in a salad the other day (with heirloom tomatoes, a little panzanella, and burrata – oh my god), and I’ve been wanting to make them. Yay! As an aside… I’ve been also yearning for a dish I tried last year, in a little tupperware from a friend of a family member (just to explain why this has been somewhat difficult to track down…). Anyone have any associations with Indonesian Pickled Cauliflower? or guesses, perhaps? It was bright yellow – not curry, but turmeric, I think – and super-tart. I really love pickled vegetables…mmm! David: just went online and ordered a couple bottles of maple vinegar. Only found one manufacturer, Boyajian. Thanks for the rec. When I gave my quasi recipe for beets and pickled onions, I forgot, add a handful of finely chopped flat leaf parsley. Mmm, this sounds wonderful. I’ve tried other recipes, but I like the idea of the chili pepper. Sounds like a good “zing” to add. My mom makes your ice cream all the time and I just love it. Cinnamon is the best! I went to Chez Panisse this summer and I took a tour of the kitchen. I want to go to Paris someday and you make it look so yummy! I have some of Elise’s pickled onions in the fridge. So frickin’ tasty. 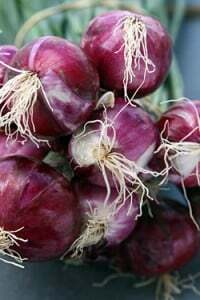 Now, since red onions are one of the good things we have plenty of around here in Israel….. I would like to make this recipe to serve at least six – how do I go about increasing quantities??? I would appreciate your help. Thanks! Zelda: Thanks! And am glad you’re enjoying the site. 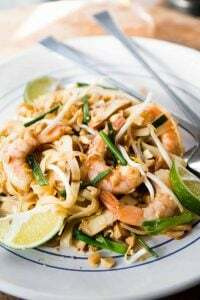 This recipe can be easily doubled or tripled. 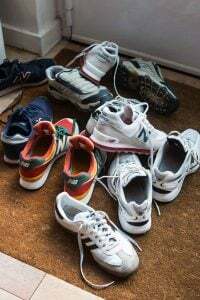 Leftovers can be stored in the fridge for a few weeks or so. Chloe: Glad you had fun at Chez Panisse. I think it’s really special that they encourage people to take a walk through the kitchen. I sometimes want to do that when I go out to eat, too! If you haven’t tried the fried Brussels sprouts with lemon at SPQR in San Fran, you’ve not lived. I HATE Brussells sprouts, yet I love these. It’s a pain to get a table (or was several months ago…maybe the mobs have become smaller) but it’s worth every minute of waiting time. I use preserved lemons chopped up in fish soup (tomato broth based) to great effect. We have a Meyer Lemon tree in the back yard and have always used them successfully for preserved lemons. Thanks for the pickled onion recipe! Hate to be such a pain… but what I meant is how much vinegar and spices would I need if I make let’s say 3 onions….. and could I use aceto balsamico instead??? ?Sorry, I never pickled anything before… :( Thanks!! 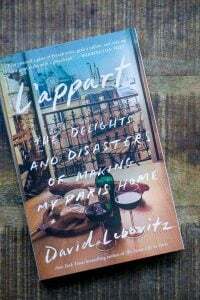 Mark Bittman is man of much talent, but you dear Mr Leibovitz are completely wonderful. Goofy socks or not, I wouldn’t change a thing. I recently had pickled red onions for a side dish to a German meal of sauerbraten and they were wonderful! I don’t even like red onions but these pickled red onions had great flavor. 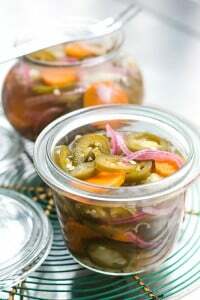 I absolutely adore pickled onions and any recipe for a quick pickle is a keeper in my book. My mother tells me that I used to eat so many pickles when I was a child that my lips would actually turn white. Which begs the question, why didn’t she stop me?! These are gorgeous! I have some pulled pork shoulder in the freezer, homemade tomato chili BBQ sauce in the fridge, cornbread ingredients ready to go, and now will make these to go with! Yay . . . and thank you! Panama oand other Latin Americian countries have the best pickled onions. They put it on top of fried fish and its awesome. I built the pickled red onions but committed a f/u. I accidently substituted juniper berries for the allspice berries. I am not going to jump up and say mine is better, but you may just want to try this substitution. I cut the sugar in half. Next time I’ll leave it out all together, just for an experiment. Oh, I dice the onions rather than thin-slice. They come through more crunchier. I made this recipe (except that I had to substitute nearly everything) and sat down and ate the whole thing in one day. BTW- I’ve had to learn to make my own Mexican food since living in Australia, and your Carnitas recipe has saved my soul! Pickled red onion is my favorite thing. In fact, I am in the process of starting my own canning Co. The city of Chicago doesn’t make it easy though. There currently is no licensing available in Cook county for canners. I know it’s a safety factor, I am all behind that, but, there should (at least) be more dialouge regarding this subject. Are you with me? Anybody? oh. my. gosh. so good. thanks for the recipe!